Players can kick back and enjoy the summer delights in Playtech’s latest project, Beach Life. This slot carries a lofty reputation and the reason lies in the gigantic progressive jackpot the game carries. After running the figures we’ve found that Beach Life’s average progressive pay-out is $3.25m and in 2012 the biggest ever sum was won, standing at an enormous $8.2m!! It is widely known that the op prize is hit at least every 131 days so keep an eye out for that eye catching counter when playing. It seems as though there’s no limit to Beach Life’s pay outs and this is capped off by a decent range of in game features and a singular underwater bonus round. The underwater theme can be seen throughout the slot and plays nicely into design team who really went to town in the styling. High quality graphics and animations make the game feel a lot more authentic, with cool sound effects finishing of the gameplay nicely. Beach babes, ice lollies, sand castles and ice creams all feature in the reels, each with a variety of values. The animations played out when a winning line is hit make the sub game much more interesting, from the surfer’s riding the waves to the divers swimming around in beautiful blue water. 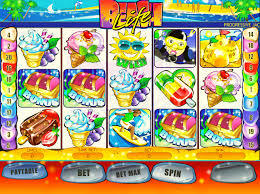 Apart from the whopping progressive Beach Life slot offers players the chance to cash in even during the standard game. The wild symbol is represented by the bright sunshine and like usual substitutes for every other symbol within the game, allowing for more winning lines as a result. Furthermore, the sunshine wild is in fact the key to triggering the slots whopping progressive by spinning all five on the 20th pay line. Beach Life also has a lucrative scatter to look forward to which is represented by the sandcastle symbol. Spinning 2,3,4 or 5 sandcastle scatters anywhere on screen will reward players with 2x, 5x, 50x and 500x respectively. The third and final symbol to keep an eye out for is the treasure chest, which triggers the games singular bonus round when three are hit in one of the twenty pay lines. Players are greeted by 14 closed treasure chests and are asked to reveal three of them, each containing varying cash prizes. After all three have been chosen all winnings are then accumulated and the standard game resumes. The popular theme of this slot in alongside to the potentially lucrative yields will surely attract all sorts of players to this underwater adventure. This is now one of the biggest names we’ve ever reviewed and it delivers in leaps and bounds.